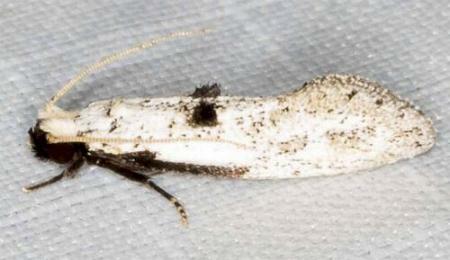 The adult moth of this species has white forewings with some brown speckles, each with black line along the costa. and a black tuft of scales near the middle of the hind margin. The hindwings are pale brown. The head has black scales in front, and white on top. The wingspan is about 2 cms. Volume 47 (1923), p. 191.